DinnerNations' 1st event of Protected content at Cooks and Soldiers! Cooks and Soldiers is located off 14th street in the Midtown area. 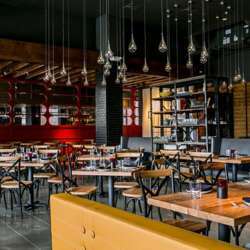 The Upscale restaurant offers the best tapas from Spain’s Basque region and larger shareable portions cooked on a wood-burning grill. Behind the bar, Cooks & Soldiers offers guests an extensive collection of Basque and Spanish wines, txakoli and ciders, in addition to craft beer and signature cocktails. Be on time as we have a 10-minute grace period for our reservation. Valet parking is available on 14th street. Please RSVP by the end of the evening on Wednesday, January 23. The restaurant seats us when most of the members in our party have arrived. If you know you will be up to 15 minutes late, please call Mikki and we'll adjust accordingly. Kindly consider your DinnerNations fellow members and host. If you arrive past the 15-minute courtesy time, especially if advance notice is NOT given, we will not be able to guarantee your reservation. Most restaurants will not hold tables for late attendees to prevent last-minute no-shows. Finally, if you need to cancel your RSVP, please do so by 6:00 p.m. on Thursday (January Protected content contacting Mikki or send a notification on the wall of the DinnerNations Atlanta Activity Group. Canceling promptly and as early as possible is much appreciated as it may allow another member to attend a previously closed dinner. Looking forward to dining together!